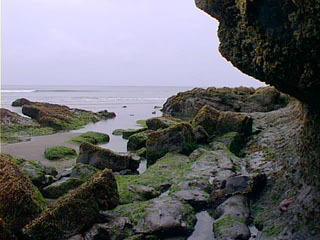 Lava beds on North Beach. Over the years, the weather has carved all kinds of holes and pockets and ridges and burps into them. I explored over here for hours. Right next to this is a blowhole, that I thought I had a picture of, but I guess I don't. There are a couple of spots that look like perfect little bathing pools, and a hundred years ago I would have made a fire on the beach and heated up some really big rocks and dropped them into the pools and soaked there while I watched the tide come in. No. On second thought, I would have paid someone in clamshells to heat the rocks and BRING them to me.